London, England (CNN) -- A taxi driver shot in the back by Cumbrian gunman Derrick Bird has described how he dived for cover as he watched Bird shoot a friend in the face. 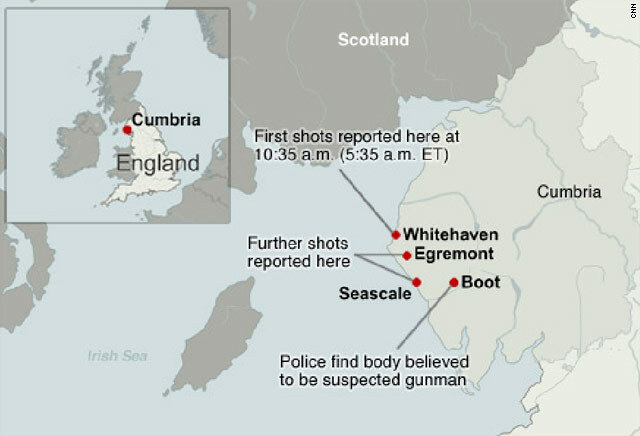 Twelve people were killed in a shooting rampage which began in the port town of Whitehaven on Wednesday and ended with Bird, also a taxi driver, apparently shooting himself near a remote Lake District village. Don Reed said he watched in horror as Bird walked up to a taxi rank in Whitehaven and shot another driver, Darren Rewcastle, at point blank range. "He turned up and shouted 'Darren' before walking up to him and taking his face off. I saw it. He just shot him," Reed, a former soldier, told the Liverpool Echo. "Then Derrick pulled up by me, raised his shotgun and got me in the back as I took a flying dive. Half the bullet got me and the other half went into a shop window across the road." Reed said his military training "kicked in" as he crawled away on hands and knees, using cars for cover. "I got next to Darren Rewcastle on the floor. His face was gone. I stood up and Derrick came forward as I tried to open taxi doors to put between us." 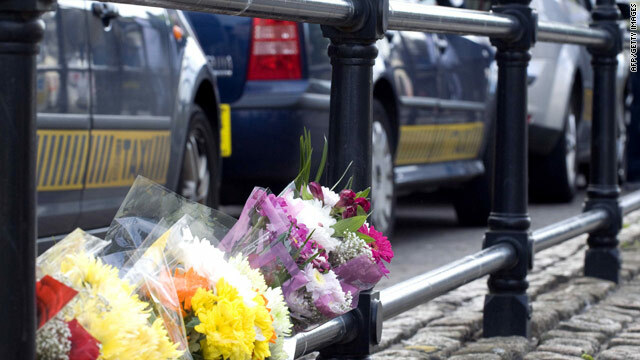 Bird then drove away, shooting several other taxi drivers in the town, the Echo said. Reed said he had known Bird for 20 years. He said Bird had been on vacation to Thailand with some of his victims. "I haven't a clue why he did it, it's beyond my comprehension," Reed told the Echo. Reed was taken to a local hospital for treatment for a gunshot wound and later released. A local taxi firm owner said Bird had been involved in a dispute with other drivers at the rank -- including Rewcastle -- who he had accused of taking "fares" from the back of the queue. "There's been an argument on the rank which was in relation to taking people off the back of the rank, instead of sending them to the front," he told the UK's Press Association. "It's an ongoing thing. It came to a head on Tuesday night and maybe, with any other problems Derrick had, it contributed to his behavior." Meanwhile residents of the village of Boot have spoken of how their idyllic Lake District hamlet became the center of a frantic police manhunt as cars were forced off the road and drivers witnessed a woman shot in the face. "Two cars came screeching down, one after another because they had been almost road-raged off the road by this bloke. After that they saw him shoot the girl in the face," Rose Bogg, 63, told PA. Bogg said residents were warned to stay indoors. "There were helicopters around the place because they were searching for him... It was really scary. We knew he was in the area and we had heard he was on foot by then but nobody knew exactly where he was." After two hours, Bogg and her husband heard that the gunman had shot himself nearby. "This is just an out of the blue thing. Everyone is very shocked," she said.